Users can simply copy and upload the entire subdirectory of a specific barcode web font from the ConnectCode solution and have barcodes created on their websites immediately. 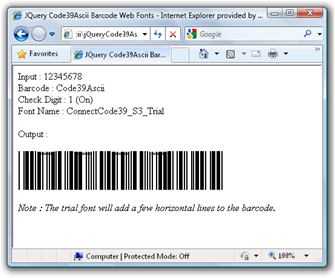 The "Resource/webfonts/HTML5/jQuery/<barcode name>" directory contains the web fonts, HTML web page and jQuery programs for the different barcodes shown below. Click on the links below to see a sample of the barcode generated. Note : The registered version contains the full set of fonts of different sizes in the subdirectory. Users can remove the fonts that are not in use to reduce the number of files to upload.